Paint colors can make a difference in enjoying or feeling uncomfortable in a room. The color is even more exciting when we realize how it affects the way we see space. Color can alter our perception of a room's size and shape. Are you trying to determine how long to paint a room? Take a look at these tips to assist you in your painting project. If a room is very large and doesn't feel comfortable, paint the ceiling a darker color than the walls to make it appear lower, thereby making the room feel cozier. Conversely, if space makes you feel claustrophobic, paint the ceiling a lighter color, which will raise the apparent height of the ceiling. As a result, the room will feel more spacious. You can also paint the ceilings of exterior spaces, such as the porch. A soft blue will give the illusion of the sky above. Enlarging a room with lighter colors enables your eye to travel continuously around the space, making the room appear more spacious. When you use different colors, your eye stops at the line where the color changes. This makes the edges, and therefore the size of the room, more apparent. You see the boundaries. With the same color, you don't see boundaries and space seem to continue. Darker colors can make a room feel cozy and personable. Don't make these painting mistakes and assume dark colors will always make your room feel like a cave. When walls are a deep color and trim is white or another light color, the eye notices the borders of the space. If the room is small, this will accentuate the feeling of enclosure. However, if the trim does not stand out because it's painted a deeper color as well, the eye does not stop at the edges or borders but continues around the room. Because the eye doesn't register the borders, space feels like it continues on, so it feels more expansive. If you have a long, narrow space, paint both end walls (the shorter ones) a shade or two darker than the other walls so the end walls feel closer to you. As a result, the room appears to be more of a square shape. If you have very large, bare walls, break up the space with molding; paint different colors above and below. Use a darker color on the bottom to ground the space. Painting vertical stripes will make a room space feel taller. Conversely, horizontal stripes make space feel longer. In a small home, paint adjoining rooms the same color. By doing this, the eye keeps moving from room to room and judges the space as being larger than it is. Use paint color to disguise unattractive items. Sometimes there are features in a room we hate looking at but can't get rid of, such as heating or AC vents. Paint these and other "eyesores" the same color as the walls so they blend in and become less noticeable. If you have lots of angles and other architectural features you want to downplay, paint all surfaces the same color. This is common in attic rooms. Sometimes these features are attractive. To highlight a unique ceiling or decorative trim, paint the walls a different color than whatever feature you want to highlight. 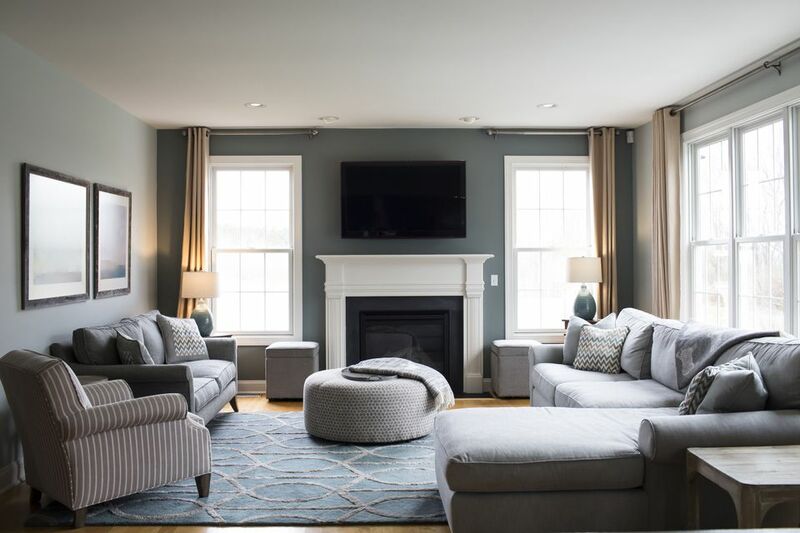 There are so many ways to use color when staging a home to accentuate the positive features and downplay or eliminate those that are less than desirable. Determine what your goal is when staging your home with color. Take into account how many windows let in natural light and play up your home's best features with these simple paint color tips.